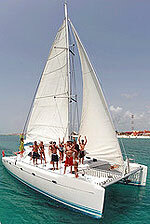 Puerto Morelos Snorkeling by Catamaran - Save Here! ADULTS & KIDS : $75.00 $69.50 - YOU SAVE 7% ! Our Catamaran Adventure tour will take you snorkeling on the world's second-largest barrier reef - the Great Mayan Reef. Nestled within the Puerto Morelos protected marine preserve, you'll be dazzled by the healthy coral reefs and the colors of the tropical fish that live here. We will sail across some of the most beautiful beaches in the Riviera Maya, snorkel on some of the most dazzling coral reefs, and enjoy lunch at a marina-view waterside restaurant. Your fun-loving crew will be serving you drinks from the all-you-can-drink open bar as you sail on the clear blue waters of the Caribbean Sea. This catamaran sailing tour is recommended for guests staying in the northern Riviera Maya, such as Riviera Cancun and Puerto Morelos, as well as guests staying in the Playa del Carmen area. The catamaran is new and luxury and the silence of sailing is sooo nice! Cruise Passengers: This tour is not suitable for cruise ship passengers. If you are on a cruise ship, consider doing our Catamaran Sailing instead. Food & Drinks: You are welcome to bring extra food and drinks if you like. Add $10.00 $9.50 Per Person for Lunch at the marina's waterside restaurant including 2 Drinks. The lunch option is only available with the morning tour. Extra Cash for Tips, Additional Services, Fees, Etc.